For as long as I can remember, I’ve been hunting for my dream laptop. For years — since the advent of the ultrabook — I have dreamed of something as light as a magazine to throw in a bag, with a high resolution screen, decent build quality, great battery life, good enough performance and a good trackpad. Is that too much to ask? (Probably). That perfect laptop has been attempted by computer makers, but manufacturers haven’t yet managed to nail down the magic formula. I’ve had laptops that promised something along those lines, like the HP DV2 or the MacBook Air, but all of them have had a flaw that ultimately made them awful to use. Apple has finally delivered my dream machine with the new MacBook, for $1,299. It’s so close to perfect that it’s worth thinking about, even if it means getting a first generation product that forces you to make a few compromises. This thing is ridiculously light, so much so that I kept forgetting it was in my bag when I went out. You can throw it in a backpack and you’ll never know it’s there. It’s light enough to forget it’s there — so much so that I’m worried I might accidentally throw it in the trash when mixed in with magazines on a table. It probably helps that I’m coming from two years using a 15-inch Retina MacBook Pro, which is the bulkiest, heaviest laptop in Apple’s modern line up. I never really had any problem carrying the MacBook Pro, but by comparison it feels like a ton of bricks in a backpack. The difference between the new MacBook and the MacBook Air is about 397 grams — which happens to be the about the weight of a can of soda. I really like how easy it is to take everywhere and love that it’s so thin. It feels like holding a magazine. To me, it seems like Apple’s created a computer that’s as small as the iPad Air 2, but with the benefits of a full desktop operating system. It’s hard to describe how enjoyable it is to open something so thin and light, and get the full power of OS X. The only other time I’ve ever felt this way was booting up Windows on the Surface Pro 3 for the first time — it almost doesn’t feel like it should be possible on such modest hardware. 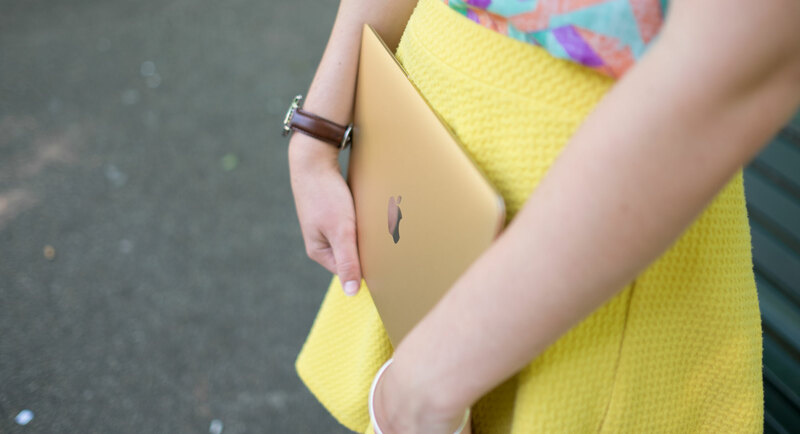 I love that Apple’s bringing color back to the MacBook, too. When the black and white MacBooks disappeared a few years ago, I was disappointed that everything looked the same. Apple had taken the fun away from the line-up. Now you can get gold, gun metal or silver. I was hesitant to try gold at first, but it’s a far less offensive color than initially thought. I came to like it, and suspect that this version will sell like hot cakes — people in cafes, on the tram and in other places approached me to fawn over it and ask where I got it. For that reason alone I’m not sure I’d want the gold for myself, but there are plenty of people out there who will love the attention and are excited to have the colors back. It will be a nice change from the sea of silver at tech events. The first time you use a Retina display (or high-DPI equivalent), it ruins normal screens for you. After using the MacBook Pro for a few days back in 2013, I found other screens pixelated and low-quality. Now I can’t use lower-resolution devices without cringing. You could call me picky, but I’m something of a pixel-density enthusiast and it’s something I won’t compromise on. When you spend so much time staring at screens, it’s one of the most important things in a laptop..
I’d always dreamt of squashing a high-DPI display into something ultra-small, and had recently started looking to Dell’s new XPS 13 as an alternative as Apple had taken so long to update the Air with a better screen. The new MacBook’s display is awesome. It’s crisp, great at color reproduction and finally brings Apple’s lovely Retina display to a tiny form factor. It’s nothing new, but it’s magical to finally get it in a tiny laptop. The panel is a 12-inch 2304-by-1440 pixel display that works well in most situations — it’s bright enough to use outside, but as with the MacBook Pro lineup, the glossy display makes it pretty difficult to see in direct sunlight. I have no complaints, but I want Retina everywhere. Now that the new MacBook has one, it makes the Air’s display look dim, crappy and old. Somehow Apple has squashed impressive speakers into a tiny laptop. I was expecting fairly crappy music quality when I saw the slim speaker grille along the top, but I was pleasantly surprised by what Apple’s been able to do with it. For a thin, light computer, this has the best speakers I’ve ever heard — they’re crisp, loud and have a surprisingly good sound stage. In general, good for movies, music and other internet videos. Apple invented a new mechanism for keys on the MacBook. It both saves space and makes the keys more stable for the thinner frame, but changes the way the keys feel as you type on them. The new keyboard has been the subject of much debate since Apple launched the device. App developer Marco Arment labeled the keyboard as “not good” and Gizmodo called it “uncomfortable.” At first, I absolutely hated it, but after a few weeks it started making old keyboards feel clunky. Switching between the two, after a couple of weeks, is a little disorienting. After a few days riddled with typos and confusion, you get used to the different feel of the keys and maybe even prefer it. Instead of pushing down on a big chunky key, your fingers feel like they’re gliding. There’s far less ‘give’ than a traditional keyboard, which is odd at first, but enjoyable if you’re a good touch typer. The keys are a lot closer together, but I found it didn’t really make a difference at all. Ultimately, it still feels like a real keyboard, just different from what you’ve used for the last decade. Change is hard, especially one this drastic. I used the MacBook as my primary device for a few weeks and now secretly wish all keyboards were like this, even though other reviewers seem to disagree. There’s one problem with the new keys, for me: if you use them all day your fingers get really tired and sore. I never had this problem with a normal keyboard before, but still get a little worn out after 8-10 hours of usage. The majority of people probably don’t type as much as I do, so you’re probably OK, but it’s something to be aware of if you’ll be typing on it all day. 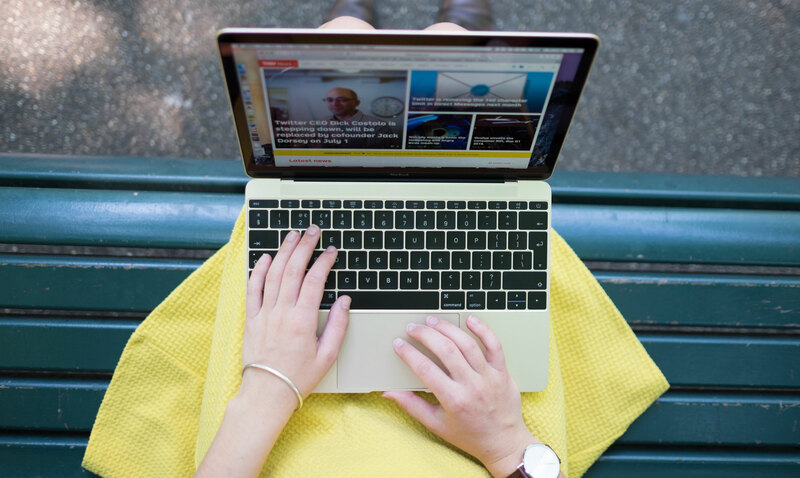 My advice on the new keyboard would be this: if that’s what’s stopping you from buying the new MacBook, then purchase the laptop and give it a chance. Use the 14-day return policy to your advantage and try to learn to love it — simply running your fingers over it in an Apple Store doesn’t do it justice or give you adequate time to adjust. It’s good, once you give it a chance. This review was written in its entirety on the new MacBook. The new trackpad is breaking my brain. I know it doesn’t have a physical click, but I could swear it does. Sure, it feels a little shallower than the MacBook Pro because it’s just a tiny vibration tricking your mind into thinking it’s a physical click, but it’s almost as good as the old trackpad. Again, it’ll take some getting used to, because it doesn’t physically move as you click, but it’s not a problem. If anything, the click just isn’t as satisfying, kind of like when you move from an old SLR camera to a digital one and the shutter ‘clunk’ disappears. You eventually forget it was any different. Force Touch, which allows you to push harder on the trackpad to trigger other actions, is interesting but a hard sell. I dig that you can push hard on a word to get the definition, but I just don’t really get it yet. It feels like a gimmick, with limited reasons to actually use it, but a lot of potential. I just forget it’s there — there’s no obvious way to know when you can use it and Apple’s built-in apps that do support it don’t make it particularly clear. 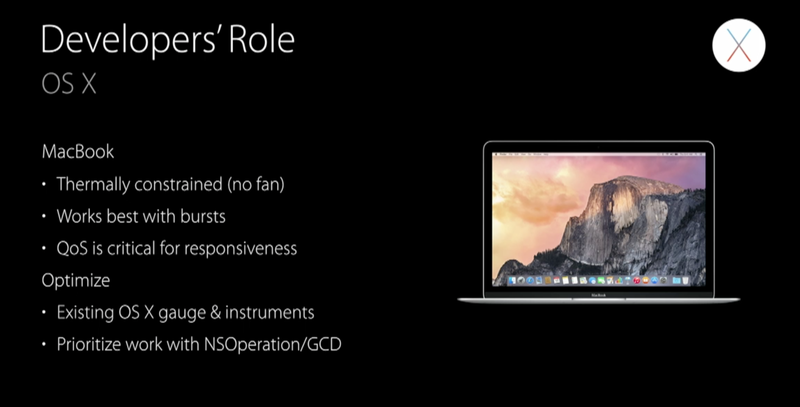 OS X El Capitan, due out this fall, fixes part of that problem by allowing developers to use Force Touch on the Web and in new ways as part of their apps, but it needs to be clearer what you can actually do with it. Other than stabbing at words to find out what they mean, I don’t see much use in Force Touch for most people in the near term. Apple could do more to help you discover what it can actually do. That’s probably about it. Yes, the new MacBook has a single USB-C port, but it’s actually not as much of a problem as I thought. It was a little frustrating that I had to carry around a dongle to charge my phone, but it seems likely a future version of the iPhone will offer a USB-C connector, particularly if Apple adds USB-C ports onto its other devices in the coming months. Docks are starting to become available which allow you to use multiple devices, including screens, from that single port all while charging your MacBook. That kind of future gets me excited, rather than having to connect four cables every time I sit down at my desk, but it’s not quite a reality yet. USB-C holds a lot of potential, but the lack of devices with cables, like monitors and Apple’s own iPhone cables, makes it a little frustrating right now. I had to carry around a USB and HDMI dongle and repeatedly forgot them, instead ending up leeching off other people’s laptops for power. When you’re using the dongle to do something, like download from a camera, it feels a little ridiculous that you can’t charge at the same time. At least once, I wanted to grab some photos but the MacBook was flat and I had to wait for it to charge enough before I could do what I wanted. You’ll only run into it occasionally, but when you do, it makes you remember why early adoption of new port types can be difficult and painful. A year from now, as USB-C sees more adoption by other manufacturers, that’ll be a different story — Google announced at I/O that Android will use the standard — but for now, it’s in an odd place because it’s simply so new. Much of the discussion around the new MacBook has focused on the slightly disappointing Intel Core M processor that Apple settled on. At the low end, you’ll get a dual-core 1.1 GHz processor, which can be upgraded to 1.2 GHz; fairly underwhelming. For this review, I used the 1.1 GHz version as my primary machine over a few weeks. You shouldn’t expect anything incredible out of the new MacBook — rendering video is probably not a good idea — but it’s a good all-round performer. For those, like me, that don’t do much on their computers outside of internet, writing, document editing and a little photo editing, it’s great. In fact, I tried to push it to the edge and found it was good enough at most tasks that you’ll probably get away with it. I compiled a few apps I’m working on in XCode, watched HD movies and did my Web development like I normally would… just don’t try to do them all at once. 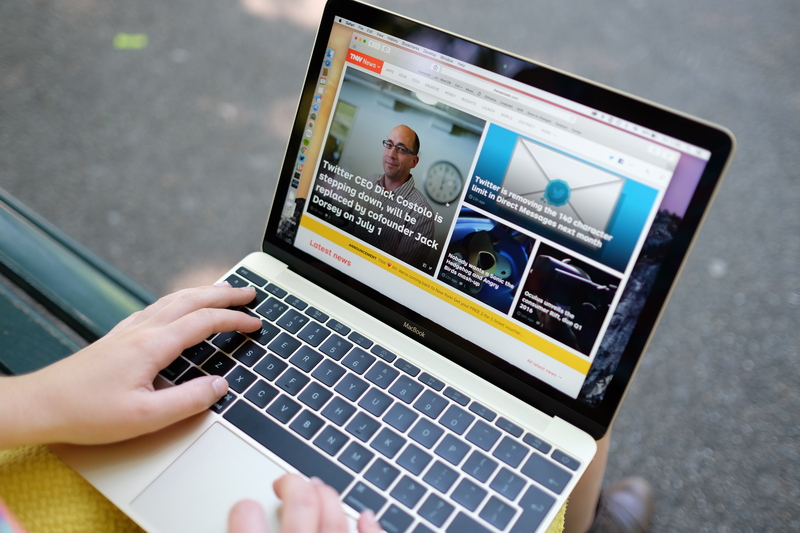 For the masses, I think the MacBook’s performance is more than good enough. I don’t think this MacBook is aimed at the technical crowd. It’s for the executive who wants an all-day computer for meetings or the university student who wants something easy to carry around with their text books. 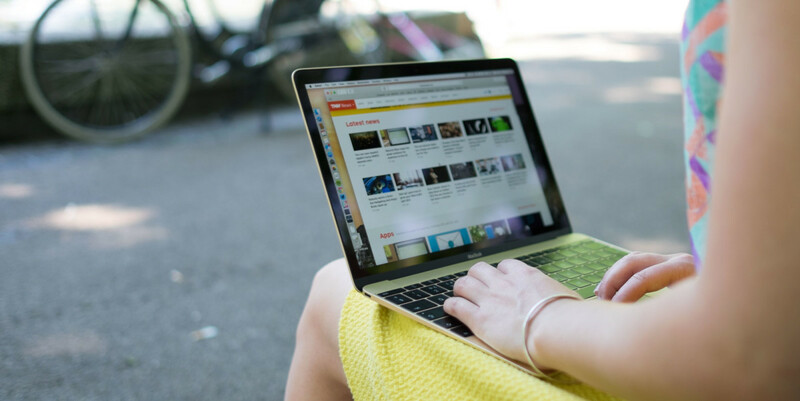 Yes, you can hit the edge of the MacBook’s performance if you push it too hard, but it’s not going to happen if you’re the average person who browses the Web and edits documents. Things you won’t want to do on the new MacBook: play any sort of heavy-graphics game, work on huge Illustrator files or compile complex applications. That’s not your average person anyway — “tech people” will try scare you away from the new MacBook by telling you it’s slow, but in general, it’s more than good enough for your daily life. Battery life on the MacBook is pretty good. I can get between 5-6 hours on average from it, when using Safari as my browser, which is similar to my 15-inch MacBook. I’d love to tell you it lasts eight hours, but I wasn’t able to squeeze that much out of it in any of my testing. Apple’s emphasised on how much space the battery takes inside the laptop during its unveiling, but we really need battery technology to improve before it’ll get much better. 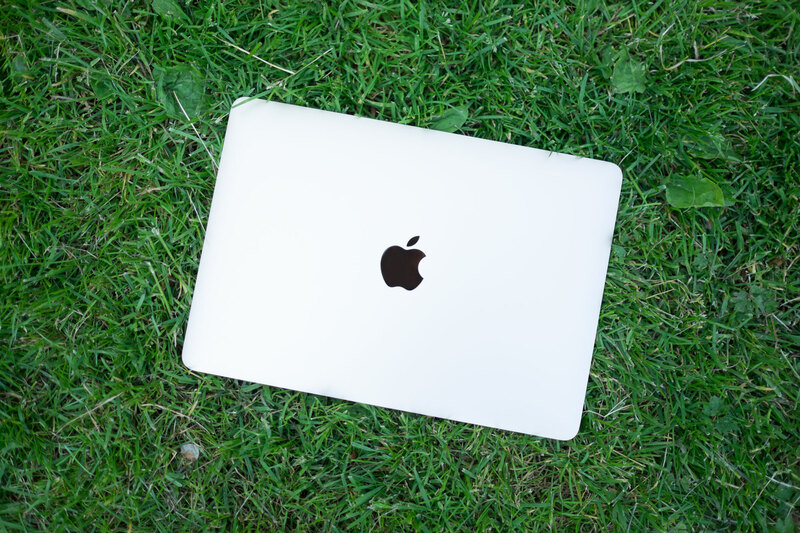 OS X 10.11, which is due out this Fall, promises to improve performance and Apple is pushing app developers to build their products with the new MacBook in mind. One thing that’s really nice: you won’t hear that familiar fan noise blaring away, ever, because it simply has none. The silence is eerie, but welcome. If this machine existed when I was still studying it would have been the perfect student laptop — they weighed at least 2 KG back then. I expect that within the next year the new MacBook will be all over campuses because it’s light, it looks good and feels lovely to use. 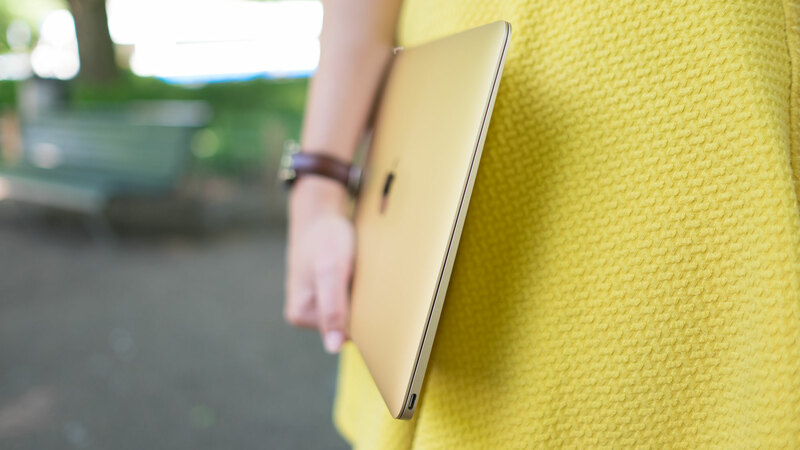 For that same reason I think it’ll be popular in businesses; the kind of people that are in meetings all day, running around the city or simply want something compact could use the MacBook comfortably. Yes, the MacBook is expensive in comparison to the plethora of cheaper PCs and Chromebooks, but you’re not going to get this kind of build quality — or OS X — on anything else. Let’s be honest: the people that are going to buy this device would’ve wanted an Apple computer anyway. Admittedly, the new MacBook is the kind of laptop people buy to get attention and I think that’s OK, because it’s great to use too. One particular type of person that would love it are those that use the iPad for the majority of the day. It’s a natural extension of the tablet; light and easy to use with a great display, but with the power of a full computer. I was expecting to hate the MacBook’s new keyboard and ultimately found I preferred it, despite what others have said. My only concern right now is that a better version, with an Intel chipset that would up the performance to a reasonable level could be around the corner. Intel’s continually delayed Skylake chipset promises better performance for smaller computers, but we still don’t know when it’ll actually ship. You could wait around and see when it gets refreshed, or you could jump in the deep end now — I don’t think you’ll regret it any time soon.